Arthroscopy is a minimally invasive technique of visualizing the inside of a joint. The word arthroscopy comes from two Greek words, "arthro" (joint) and "skopein" (to look). The wrist is a complex joint made up of many bones and ligaments, which hold the bones together (see Figure 1). Wrist arthroscopy allows the surgeon to diagnose and treat many problems of the wrist through a series of very small incisions (portals). In the last 5 years, the wrist has become the third most common joint to undergo arthroscopy, after the knee and shoulder. Because the incisions used with wrist arthroscopy are smaller and disrupt less soft tissue than conventional open surgery, pain, swelling and stiffness are minimized and recovery is often faster. Wrist arthroscopy allows the visualization of the cartilage surfaces of all bones in the wrist and better evaluation of the ligaments between the various bones of the wrist. Frequently after an injury, pain, clicks, and swelling may be indicative of an internal problem in the wrist. 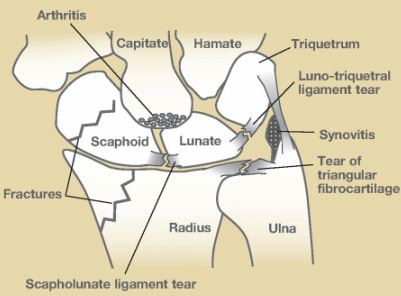 Arthroscopy is often the best way of assessing the integrity of the ligaments, cartilage, and bone. When wrist problems are encountered, many are treated through these small incisions using specialized equipment available for wrist arthroscopy. Often arthroscopy is used to aid in the reduction of fractures of the bones of the wrist. Wrist arthroscopy is also used to assess the integrity of the TFCC (triangular fibrocartilage, a cartilage structure that provides support in the wrist). Today, wrist arthroscopy can even be used to remove some ganglions of the wrist and to assess the extent and treatment of various types of fractures and arthritis of the wrist. Figure 1. The wrist is a complex joint made up of many bones and ligaments, which hold the bones together. Figure 2. A small camera fixed to the end of a narrow fiber-optic tube is inserted through a small incision in the skin directly into the back of the wrist joint. Figure 3. Introducing the instruments on the back of the hand, the surgeon can view and subsequently operate on the cyst without a large incision. 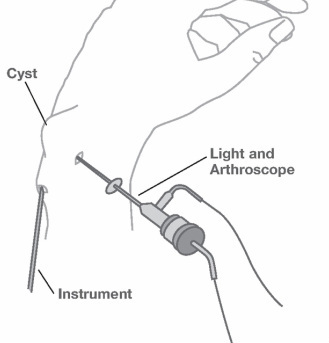 A small camera fixed to the end of a narrow fiber-optic tube (2.0mm- 2.7mm wide) is inserted through a small incision in the skin (about 5mm long) directly into the back of the wrist joint (see Figure 2). The camera lens magnifies and projects the small structures in the wrist onto a television monitor, allowing for more accurate diagnosis. 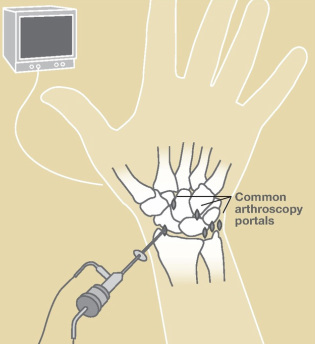 Several small incisions (portals) are used to allow the surgeon to place the camera in different positions to see different structures inside the joint as well as to place various small instruments into the wrist joint to help diagnose and treat various problems in the wrist (see Figure 3). The wrist is usually distracted and fluid is infused into the joint to expand the joint and allow improved visualization during the procedure. Sometimes wrist arthroscopy is combined with open procedures. After your arthroscopy you will most likely be placed into a protective bandage or wrist splint that allows full mobility of your fingers. The period of protection will vary depending on what was performed at the time of surgery. Elevating the involved extremity is important to prevent excessive swelling and pain after your surgery. As with any surgery, wrist arthroscopy has risks. These include infection, and potential damage to nerves and tendons (usually less than 1%). Stiffness might need to be addressed through post-operative rehabilitation. Wrist arthroscopy is not appropriate for all wrist conditions and is dependent on the surgeon’s training, expertise and comfort level.